Follow this tips to keep your driveway looking new all year around. One of the first outdoor features guests will see when they arrive at your home is your driveway, so it needs to look great all year around. Your concrete driveway should have more than a pristine appearance; it should also serve all of your basic needs. As a homeowner, you should take proper care of your concrete driveway, so it avoids cracking. 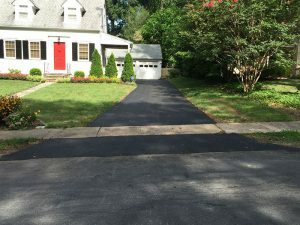 There are a few maintenance tips you should follow so your driveway continues to look brand new through all of the seasons. It is important to clean and reseal your driveway as needed to maintain its appearance. It is smart to check your driveway every now and then for spill or signs of wear. The general rule of thumb is to clean and reseal your driveway every two years or so. The best way to clean your driveway is with a power washer which will remove sediment and any stains. Consult an Edwards Lawn and Home professional for the perfect sealer for your driveway or to even reseal any cracks for you! It might seem like an efficient way to melt the ice on your driveway during the winter, but the use of deicing chemicals can do serious damage to your concrete driveway. It is crucial to avoid any products with ammonium nitrates and ammonium sulphates because they will attack the concrete chemically. The best method to melt ice on your concrete driveway is to use rock salt, but it will do damage to surrounding grass. Be sure to avoid using deicers during the first winter after your driveway is installed because new concrete is more susceptible to salt damage. An effective alternative is to use sand. Although concrete is an extremely durable material, you still have to treat your driveway with care. Avoid driving heavy vehicles like a large moving van on to your driveway. When shoveling your concrete driveway, try to avoid using a metal shovel because it can scratch the surface. This entry was posted on Friday, September 1st, 2017 at 3:08 pm. Both comments and pings are currently closed.